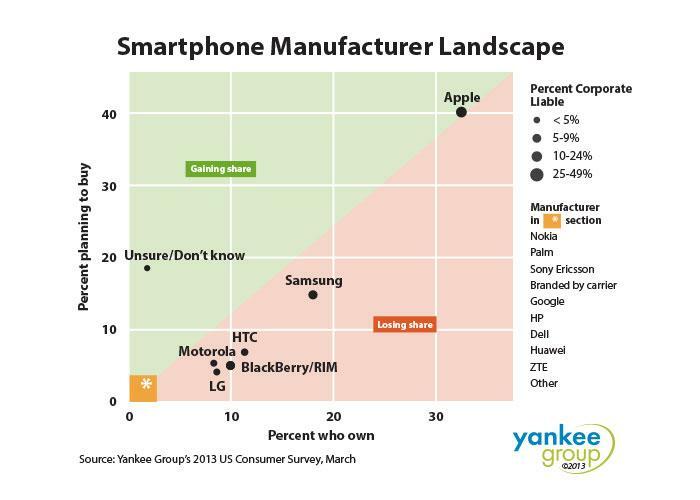 "We fully expect the Galaxy S IV to be an excellent flagship phone for Samsung, but Yankee Group doesnt see the S IV allowing Samsung to gain ground against Apple in the crucial U.S. market." Based on data collected in the Yankee Groups March 2013 US Consumer Survey, "only about 15 percent of consumers intend to buy a Samsung phone within the next six months, while 40 percent intend to buy Apple iPhones within that period," the firm reported. "Thats actually a slight decline from the December quarter. Further, Samsung isnt generating the same kind of brand loyalty that Apple owners have; in that same survey, only 61 percent of Samsung owners intend to buy another Samsung as their next smartphone; that contrasts dramatically with 85 percent of Apple iPhone owners intending to buy another iPhone," Howe wrote. "Unless Samsung works very hard to change consumers minds in the next six months, we actually see Apple gaining ownership share on Samsung in the U.S. in 2013 rather than the other way around."